It’s funny how a simple question can snowball and become a deep dive into our changing approach environment. If you don’t have time for the whole thing, skip to the video and see how this affects which approach you load and who you buy your data from. There’s a trap you’d best avoid. Be sure to come back and read, though. It could save you some real confusion. It all started with a weird note on the ILS Z or LOC Z Rwy 23 at Walterboro, S.C. (KRBW). The note says: “GPS and DME required” (emphasis mine). Can’t GPS be used in lieu of DME? Of course it can (per restrictions in AC 90-108 and the AIM), and you can fly this approach with only an approved GPS. Now come down the rabbit hole with me to understand why that’s true and see how GPS and digital tech, in general, is changing how we do IFR. Spoiler alert: This discussion reveals a trap when using GPS for DME on a localizer approach. Skip to the video to avoid the trap, or read on to see why and how you may have been reading approach charts wrong for years. Replacing a specific runway with a letter in the title means only circling minimums are available. This happens when the final approach course doesn’t align within 30 degrees of a runway, the descent from MDA to the runway would be too steep for a straight-in, or the runway environment lacks required items for straight-in minimums. The VOR/DME-A KAUG falls in the third category. Letters from the tail end of the alphabet (X, Y, and Z) are used only to identify multiple approaches to the same runway. Many times the version w the Z allows lower minimums by requiring a higher climb gradient for the missed. Different equipment requirements is another common reason for multiple versions. And, that’s the case at KRBW. Examine the Y approach. This is a pretty conventional ILS with a requirement for DME stated in the notes. The question is: Why? It’s not for a transition from the enroute environment because those notes appear on the plan view, not in the notes section. The IAF at LAMKE is a fix on V18-311, so you can get there by VOR. VOR capability (or GPS equivalent) is assumed, so it’s never stated as a requirement. By policy, no ILS requires DME for identifying the FAF or DA, so that’s not the reason either. The missed approach goes to STOAS, but that can be identified as an intersection of two VOR radials. Click here for larger image of charts. DME is only required for the Localizer approach. There’s no other way to identify the FAF at DOTMY or the missed approach point at 1.1 DME on the localizer. Note there’s no timing published. This means you can fly this ILS without DME, or GPS in lieu of DME. That note does not apply to the ILS. Before you send an email explaining notes aren’t optional, remember this approach chart displays two approaches co-charted, not one. The ILS approach is a different approach with different obstacle requirements and different procedures than the Localizer approach. The reason they share a chart is historical. Do you remember paper charts? (If not, Google it on your “smart phone.”) Because almost every ILS had an accompanying localizer approach that shared most of the same information, co-charting the two approaches kept the binders of charts a bit less bulky. This applies to your approach request, incidentally. You ask for the ILS or the Localizer and get cleared as such. If you switch from one to the other part way, say because the glideslope failed, technically you should get a new clearance. No one cares in practice, but that’s another discussion. 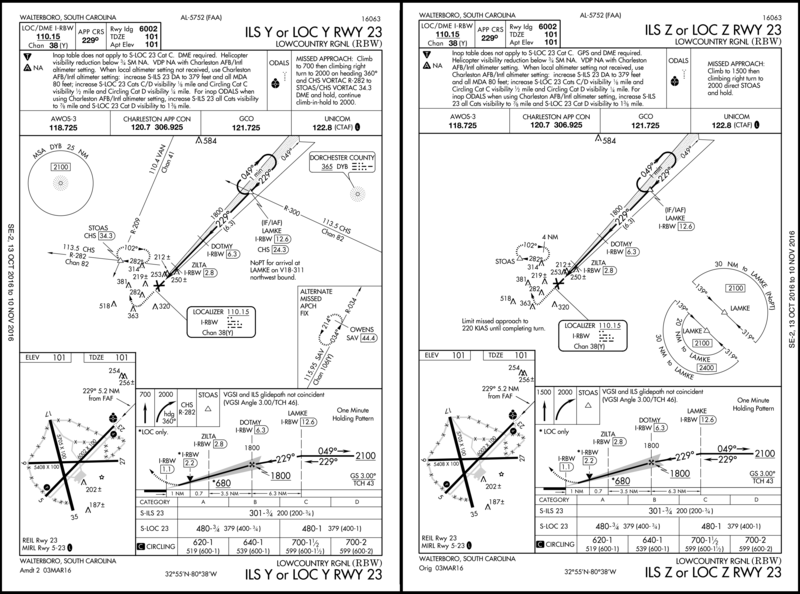 Because two approaches are represented on the chart, the name is: “ILS Y or LOC Y Rwy 23” rather than “ILS or LOC Y Rwy 23”—and, yes, that means the title of the Y and Z approaches at KRUT are wrong (as are many others). This reveals how deep the confusion goes. The charting office even had to straighten themselves out. Expect the incorrect titles to change as charts are updated. Now check out the Z approach at KRBW. GPS is used for transitioning from the enroute environment with no-PT sectors allowing direct LAMKE. But it’s not required for this because from LAMKE you could arrive via airway, just like the Y approach. DME is required for the same reason as the Y chart: it’s only for the localizer approach and you may substitute GPS. This approach has a different missed in that you fly GPS-direct to STOAS rather than intercepting a radial east of STOAS and then proceeding outbound. This requires GPS and applies to both the ILS and the Localizer approaches. And, essentially, the FAA will be doing that in the future. A new area in the briefing strips will specify what’s required for which. I don’t have the details, but I’ll be happy to see it put into effect. Anyone flying with an IFR GPS needs to know how this co-charting clarification has changed which approaches you load from the GPS database. There are now separate approaches for the ILS and for the LOC. Previously, you’d only see the ILS approach in the database. That approach might, or might not, contain the needed stepdown fixes for the Localizer. It was left to you to concoct a solution if those step-down fixes weren’t included. Now there are two. Check out the video to see the difference and why it matters. The other point is: Why bother specifying DME required when GPS is required and that would cover your need for DME? Well, imagine the Y version didn’t exist and you were in an old /U airplane. If you could remove the need for the published missed, and you were flying the ILS so you didn’t need DME, you should be able to shoot the ILS without GPS or DME despite what the note says. I’ve never seen guidance or an FAA position on this, but I can tell you in practice we used to do this all the time where approaches required equipment for a missed we didn’t have installed. We requested alternate missed approach instructions and got on with business. No one complained or gave us a number to call on landing. I’m not saying that’s an approved procedure, but it does point out how understanding all those notes on the chart is essential to your strategy for flying the approach. It’s been a long-standing policy in both AC 90-108 “Use of Suitable Area Navigation” and the AIM that you can’t use a GPS to shoot a VOR approach unless it says “or GPS” in the title. From Note 4 of AIM 1-2-3: “Pilots may not substitute for the NAVAID (for example, a VOR or NDB) providing lateral guidance for the final approach segment.” The emphasis is mine. The way I read that then and still do is Note 4 is all navaids, including Localizers, SDFs and even an MLS if you can still find one (don’t touch them, they’ll make you go blind). Note 5 makes exceptions to Note 4. So lacking further clarification, which hasn’t appeared in the intervening year, it seems you can still go for it. There’s no clarity on what to do if the two sources disagree. Do you follow the GPS or the VOR? Personally, I’m following the GPS until that INTEG light annunciates. But that’s just my opinion. Suppose there’s a NOTAM raising the missed approach holding altitude from 4000 to 4500. Can you annotate the approach chart so “4500” simply replaces “4000” in the graphical depiction? A. You can’t. Editing approach charts is forbidden. C. You can use the text annotate tool. However, it’s just text so the “4000” will show through from behind. D. You can use the text annotate tool and customize the background of the text box to block the underlying text.